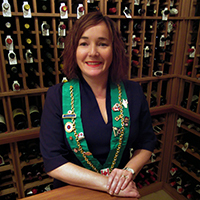 The first official meeting of the Calgary Bailliage of the Chaine des Rotisseurs was September 1974. With over 44 years of tradition, it is my greatest honour to serve our membership. As I accept this responsibility, I think of the many great Baillis that have served before me: Mr. Painsi, Mr. Baekland, Chef Parkinson, Chef Hegnauer, Ms. Findlay, Mr. Wilson and Chef Hansen to name just a few. Not only have I had the privilege to share a table with these folks but also I can call them friends. For me the Chaine, is the highest example of camaraderie of the table. Our Diner Amicals, and Ordre Mondial events provide the most beautiful backdrop for wonderful conversation. The Chaine is a community of food, wine, and spirit enthusiasts that come together to celebrate our great Chefs, Sommeliers, and restaurateurs. I always look forward to arrival and to see that seating chart. I love to meet new Chaine members, and to visit with old friends. A great team supports our Calgary Bailliage: Susan Bauerfind, and Mel Miners have served our Bailliage for many years, and without their expertise we would be lost. My heartfelt thank you to you both. Joe Scorgie, Jeff Merrin, Linda Robinson, Max Labhardt and Ashley James are all incredibly talented professionals that make my job so very manageable. For our second year, we are proud to host the Young Sommelier Competition. Linda Robinson and Joe Scorgie, we thank you for your commitment in developing this important tradition. 2019 will be a very exciting year, as Calgary will play host to both the National and International Jeunes Competitions in September. On September 21, 2019 we will host the National Chapitre Dinner at the lovely Hotel Arts. The National Planning Committee is already working closely with our Bailliage to make our event a world-class event. I look forward to sharing a conversation, and perhaps a sip of fine wine with you soon. Complete details and invitations on the events page.